Cross-branding master Richard Branson is boldly going where only billionaires can go with the inaugural flight of his new spaceship. Soon, rich people can travel into space and be a captive audience to the Greatest Salesman of All Time. 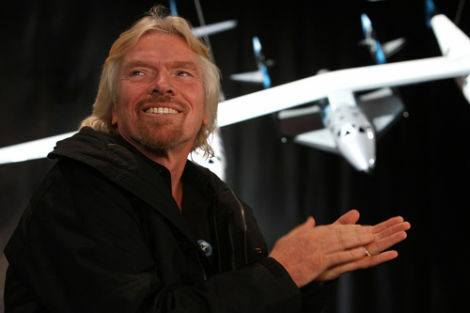 Virgin Galactic's cleverly named VSS Enterprise flew over the Mojave Desert in what Branson hopes will be the start of the newest trend among the wealthy. Surely passengers will be offered the chance to buy Virgin Mobile prepaid minutes for calls home, among many other Virgin-related souvenirs.